Discussing, while having treatment with my physiotherapist/sports masseuse about what was actually going on with my shoulder. She suggested my injury was that of Upper Crossed Syndrome, which would be very common for wheelchair users, wheelchair sports competitors (those that aren’t normally chair users), people using crutches (both able-bodied individuals recovering from injuries as well as more permanent users). Upper Crossed Syndrome (UCS) is also known as cervical crossed syndrome. UCS is also referred to as proximal or shoulder girdle crossed syndrome. In UCS, tightness of the upper trapezius and levator scapula (both in the upper back) on the dorsal side crosses with tightness of the pectoralis major and minor (chest muscles). 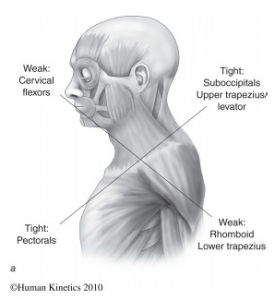 “Weakness of the deep cervical flexors ventrally crosses with weakness of the middle and lower trapezius. Specific postural changes are seen in UCS, including forward head posture, increased cervical lordosis and thoracic kyphosis, elevated and protracted shoulders, and rotation or abduction and winging of the scapulae. Go to 3:08 of the video has she explains how having a ‘simple’ tennis elbow injury could be the result of tightness in the shoulder and pectoral muscles. “As Dr. Vladimir Janda noted, the upper trapezius tends to be tight and strong, while the lower trapezius tends to be weak. While this imbalance is commonly noted in his Upper Crossed Syndrome, the imbalance is regularly seen in patients with secondary (functional) subacromial impingement.” Dr. Page. However, a paper by Phil Page (2011) would argue that getting a UCS injury from basketball would not be the case. But it would, in fact, be as a result of a subacromial impingement. “Subacromial impingement is a frequent and painful condition among athletes, particularly those involved in overhead sports such as baseball and swimming. There are generally two types of subacromial impingement: structural and functional. While structural impingement is caused by a physical loss of area in the subacromial space due to bony growth or inflammation, functional impingement is a relative loss of sub- acromial space secondary to altered scapulohumeral mechanics resulting from glenohumeral instability and muscle imbalance.” Dr. Page. First described by Neer, shoulder impingement has been classified into two main categories: structural and functional. Subacromial impingement can be caused by narrowing of the subacromial space (SAS) resulting from a reduction in the space due to bony growth or soft-tissue inflammation, (“structural”) or superior migration of the humeral head caused by weakness and/or muscle imbalance (“functional”). It is possible that some subacromial impingement results from a combination of both structural and functional factors. Subacromial impingement occurs when the structures in the SAS (rotator cuff, biceps tendon long head, and subacromial bursa) become compressed and inflamed under the coracoacromial ligament (strong triangular band, extending between the coracoid process and the acromion). This ligament, together with the coracoid process and the acromion, forms a vault for the protection of the head of the humerus. The supraspinatus tendon, in particular, is at highest risk for irritation and subsequent injury because it is the most likely to contact the acromion when the humerus is abducted to 90° and internally rotated 45°. Functional impingement is related to glenohumeral instability and is sometimes described as “functional instability,” occurring mostly in overhead athletes less than 35 years of age. The act of throwing may cause tissues below the coracoacromial arch to be subjected to subtle micro trauma, leading to inflammation and tendinitis. Dr Janda suggested that subacromial impingement results from a characteristic pattern of muscle imbalance including weakness of the lower and middle trapezius, serratus anterior, infraspinatus, and deltoid, coupled with a tightness of the upper trapezius, pectorals and levator scapula. In conclusion, while structural impingement sometimes requires surgery to alleviate pain, functional instability requires the implementation of precise therapeutic exercises with the goal of restoration of normal neuromuscular function. Shoulder stability and mobility will generally only cause you problems if you solely strengthen your chest and/or play wheelchair sports which are heavily dominant towards the muscles in the frontal plane (i.e. chest, triceps, quads and hip flexors). In the video, I talk about ways in which you can correct some of these problems. Page, P., C.C. Frank, and R. Lardner, Assessment and treatment of muscle imbalance: The Janda Approach 2010, Champaign, IL: Human Kinetics. Brossmann, J., et al., Shoulder impingement syndrome: influence of shoulder position on rotator cuff impingement--an anatomic study. Am J Roentgenol. 1996;167(6):1511–1515. Hallstrom, E. and J. Karrholm, Shoulder kinematics in 25 patients with impingement and 12 controls. Clin Orthop Relat Res. 2006;448:22–27. Jerosch, J., et al., [Etiology of sub-acromial impingement syndrome--a biomechanical study]. Beitr Orthop Traumatol. 1989;36(9):411–418. Ludewig, P.M. and T.M. Cook, Translations of the humerus in persons with shoulder impingement symptoms. J Orthop Sports Phys Ther. 2002;32(6):248–259. Bigliani, L.U. and W.N. Levine, Subacromial impingement syndrome. J Bone Joint Surg Am. 1997;79(12):1854–1868. Graichen, H., et al., Subacromial space width changes during abduction and rotation--a 3-D MR imaging study. Surg Radiol Anat. 1999;21(1):59–64. Jobe, F.W., R.S. Kvitne, and C.E. Giangarra, Shoulder pain in the overhand or throwing athlete. The relationship of anterior instability and rotator cuff impingement. Orthop Rev. 1989;18(9):963–975. Belling Sorensen, A.K. and U. Jorgensen, Secondary impingement in the shoulder. An improved terminology in impingement. Scand J Med Sci Sports. 2000;10(5):266–278. Bigliani, L.U., et al., The relationship of acromial architecture to rotator cuff disease. Clin Sports Med. 1991;10(4):823–838. Hawkins, R.J. and J.C. Kennedy, Impingement syndrome in athletes. Am J Sports Med. 1980;8(3):151–158. PS: I’d love to know what you thought of the tips, a good tip to look at would be especially breathe out. Furthermore, you may want to check out strength and conditioning for the upper body in amputees. Hit me up in the comment section or alternatively drop me a message. I answer every email, just ask. PPS: Found this helpful ? It would mean the world to me if you joined the Fit Amputee powered by James Roberts Fitness community. Because if you don’t, how are you going to get through all the bull… Simply sign up below. Not forgetting to comply with the European Union implementing the new General Data Protection Regulation (GDPR). In order to comply with this order, we’re required to verify and confirm your intent to receive our weekly newsletter and the special offers and discounts we occasionally mail out. You can find more information about this in the privacy notice. Sign up to start your week off right with our Monday emails featuring our weekly Fit Amputee powered by James Roberts Fitness blogs on fitness, nutrition and mindset. Success! 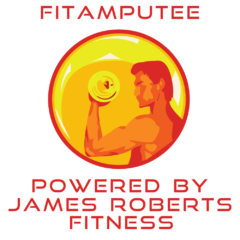 Now check your email to confirm your subscription to Fit Amputee powered by James Roberts Fitness. Previous Previous post: What really is the best to beat pain ? Next Next post: Which is better macros or meal plans ?